Over the generations, people dragooned by government have risen up and struggled against the bonds of law and ownership which oppressed them. So it was on Tayside at the end of the 18th century and in the Outer Isles in 1849. From time to time a person of unusual resolve and clarity of mind finds him- or herself thrown up into the vanguard of the rising, to speak and decide and rally. Angus Cameron, a wright from Lochaber, spoke up for the families around Loch Tay who were faced with losing their young men to a Conscription Act in the summer of 1797. Cameron knows how his people have suffered through decades of eviction and military recruitment and is anguished by how little the ordinary people can do against a heartless Establishment which has weapons, powers and privileges. Arrested and outlawed, he survived to live on. King Cameron imagines a later life for him, as husband and father, then again as spokesman for crofters facing eviction on North Uist. These are times of famine, emigration, and the desperate fight with stones and tangle-stems against clearance from the homeland. David Craig writes with power and anger of lives which have few memorials. Past times are not museum-frozen, they are brought near enough to hear and touch and smell. The whole experience of countryfolk as they fish and plant, argue and sing, love and bear children are revealed to the reader. Here is an entire class, shown (as it rarely is) in lifelike close-up, during the most testing episodes in its history, enduring the Potato Famine, battling with their bare hands against clearance. 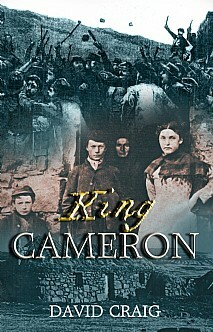 It will appeal to everyone with an interest in the Clearances, Scottish history or anyone who appreciates a good read by an expert storyteller. For a fuller appreciation of the story, readers will enjoy its sequel, the acclaimed The Unbroken Harp.